Oh no, it's the end! God, no, he'd ruin it. I want him to do it. I have his support. MegaMan Legends remake/spin-off with Bayonetta elements... It would be interesting. I just had an interview at Platinum Games the other day This will give me something to talk about if I get a second interview. Him saying he wants to be "forced at gunpoint" to create a new Star Fox game leads me to believe he's a huge creep. Keep this weirdo far away from Megaman! I second that notion, but even more than that, though, I'd like to see him make that new Star Fox game. When I first heard of Bayonetta, I thought it was made by Capcom! I'm curious on how he would take on a Mega Man game. For some reason, I see a Star Fox game from him working. But not so much a megaman game. Have you guys played Bayonetta? I'm with this guy. This right here is why either this site is full of trolls, or Mega Man has the worst fanbase ever. They shoot down EVERYTHING that's not the standard cookie cutter. I personally think this might be pretty awesome. My friend has told me Bayonetta was a pretty fun game. Uh, guys, you know he made way more than Bayonetta right? You know, just small titles like Resident Evil, Devil May Cry, and Viewtiful Joe. Sooo... X fights with his armor, and he gets more naked the more you fight? No, mister anon. We shoot down horrible ideas. It just so happens that there are a lot. You are all hopeless. THERE IS NO REASON TO PANIC UNLESS A GAME IS CONFIRMED. Hohoho hahaha I just gotta tell my friends about this. Anyway he wants to make a Star Fox game more probably but anyway he got a better chance with Capcom since he gave the idea that started Okami and entered many Mega Man boss drawing contest as a teenager. But this might be interesting.A Bayonetta styled Mega Man game or series.That was the type of Mega Man game I was hoping for..Thank u God for answering my Prayers. I really do hope he does make his own Mega Man series by Sega for Capcom like Zero and ZX from Inti. The solution is very simple, and I firmly believe this is how Capcom should tackle the next core installment of the X Series more so than Classic. I am positive everyone has seen all there is to see about Metroid Other M, correct? In my opinion I believe thats how the next MegaMan game should be. It's what X7 tried to do but didnt succeed so perfectly. Other M has different elements of 3D, Sidescrolling, FPS and then some. Reason I say this is also because Team Ninja of Ninja Gaiden fame is helping Nintendo. In Other M you can clearly see the Hack n Slash feel. If this guy gets on board with his knowledge of Hack n Slash mechanics, there would be no shame in making competition to Other M. The entire industry borrowed the Over-the-Shoulder mechanic Resident Evil 4 popularized. Zero would work so well with those elements while X and Axl could demonstrate serious gunplay. C'mon, lets make it happen! I could totally see him doing a stylized X game, as long as the story wasn't an afterthought like it was in Bayonetta. I'd totally be down for this. I think I offended Anon#10. Maybe Anon#10 wants Megaman to have more crappy car sequences? The creator of Bayonetta seems to be fond of them. Regal, have you never heard of Megaman battle and Chase? The Mario Kart to Megaman's Mario? A new Megaman car game? Id be down with that! Been waiting FOREVER for a sequel or remake of Battle and Chase! Interesting that you mention him as "Bayonetta creator", when in fact he's much more well-renowned for Okami, one of the best games I've ever played. Imagine the creator of Okami making a Mega Man game. That would be amazing! It's not like there's much else going on with Mega Man at the moment, and if they did do something else (like *sigh* another Star Force game), it would probably be seen as quite stale. So well said. Don't know why I didn't think of that angle. Okami's one of my favorite games of all time... imagine him in charge of a Mega Man game NOW. That's almost too exciting for words. Just cause he made Bayonetta doesn't mean if he were to work on a Mega Man game he would use the same gameplay. As someone who got into the series through games like Mega Man 7 and X5, I'm going to have to disagree with that. I liked Mega Man 9, and thought it was very fun and everything, but at the same time, it was a bit of a disappointment. Mega Man 10, on the other hand, I thought it was a major improvement, and I found myself less disappointed with it. A new (old school) Star Fox game? pure awesomeness dude!! Gimme gimme gimme... I think that because he was the guy behind Viewtiful Joe and Okani, I think he could do Mega Man right. Platinum is the shiznit. Let them at it! They'll do something spectacular with both franchises. Interesting that he wants to make a Rockman title, as well. I'd think he'd do better with a "new" Rockman series, rather than an established one, though. 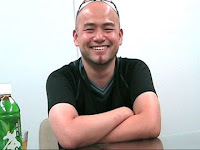 As the likes of DMC, Viewtiful Joe and Okami all demonstrate: the more Kamiya is allowed to let his ideas run wild, the better the game stands to be. I think I might suggest having Anons numbered to the blogger staff. OMG. He is capable of making an awasome Legends 3. Too many megaman game announcements or hopes but whatever. He can have Legends. Keep it from being so dang Anime Cliche maybe. But I'd feel fine with him having Starfox if he went a bit more in-depth about why the gameplay was so good. He already praises SF64 enough for me to trust him (and rightfully so, it's the top game on my list). This guy is a creative genius, and I would love to see both a Star Fox and a RockMan game from him.